When I began writing picture books, my first move was to join a picture book critique group. I found a group of interested and committed people, we figured out a schedule, we set some guidelines and then, together, we came up with a form to use for critiquing each other’s work. Though we discovered our questions to be more effective for some sorts of picture books than others, we have kept to its basic structure and questions for 3+ years now. My crit group’s critique form and its questions are like magic – they give us all the super of a sort of second sight. Seriously. When I read a manuscript with the form’s questions in mind, I have to work to find good answers and I read more closely than I ever, otherwise would. As a result, I see so much. Being forced to ask and answer particular questions about a project, we see richness and potential and challenges and hurdles we otherwise would miss. And our answers help move one another’s projects forward by leaps and bounds. I could claim that using that form on my own manuscripts doesn’t fit into my process (though how hard would that be to change?!) or that it is just symptomatic of how terribly difficult it is to give yourself distance from your own work, or of how tightly we hold onto our little darlings. Interestingly, I’ve talked to my crit partners and the fact is, none of us apply the form’s questions to our own work! Who knows: maybe because I am finally admitting this here, to you, I will finally bite the bullet… or not. But I have discovered another practice that is a near cousin — and I find it much easier to actually do. When I committed to writing, in addition to joining a crit group I did another thing: I committed to writing. Daily. Adopting my own, uninformed version of “morning pages,” I took up writing 30 minutes every morning or – it interruption was an unavoidable part of that particular morning – 1000 words. There is no wrong way to do morning pages. These daily morning meanderings are not meant to be art. Or even writing… Pages are meant to be, simply, the act of moving the pencil across the page and writing down whatever comes to mind. Nothing is too petty, too silly, too stupid, or too weird to be included…. Although occasionally colorful, the morning pages are often negative, frequently fragmented, often self-pitying, repetitive, stilted or babyish, angry or bland – even silly sounding. Good! I let up on myself, and in my morning pages – especially when I was toying with a new idea or stuck somehow with an old one — this practice emerged that I’ve dubbed “conversations with myself”. In these conversations, I ask myself a lot of questions. I let up on myself, and in my morning pages – especially when I was toying with a new idea or stuck somehow with an old one — this practice emerged that I’ve dubbed “conversations with myself”. In these conversations, I ask myself a lot of questions. It seems like her experience of being an outsider (in part as an immigrant) is a universally relatable one. And her near-blindness – and the resulting importance of story and language in her early life– give her a really unique worldview and connect to her becoming a poet. But her poems are so full of anger — would kids really connect to them? If you’re going to write a picture book about a poet, does the poetry have to resonate with a child, or can you just rest on the fact that she overcame so much and became a poet? Is there a way I could pull/use particular lines or images from her poems w/o using them in their entirety – or would that be a cop-out? Who’s story is it — Cedrick’s or Willa’s? Willa is so lonely, but she can’t stop swallowing things, which scares all the other sea creatures away. Cedrick seems to only care about finding a home. But for the story to work Cedrick has to care about connection/friends too. How do you convey that w/o overshadowing his desire for a home? IS it maybe a friendship book (2 MC’s) rather than one or the other’s story? These written conversations are not a substitute for running a manuscript through the gauntlet of critique questions, but they do embody a similar – of less targeted — sort of and self-questioning and self-reflection. If you try writing a “conversation with yourself” sometime and want to share, please do. I’d love to hear weather and whethermoves others’ work along too! Anna Forrester has taught kindergarten and second grade. Her debut picture book, BAT COUNT came out with Arbordale Publishing in, February 2017. In BAT COUNT, Jojo is excited to curl up by the campfire with her parents and brothers to count the bats flying out of the family’s barn. She is worried, too, because the colony has been shrinking. 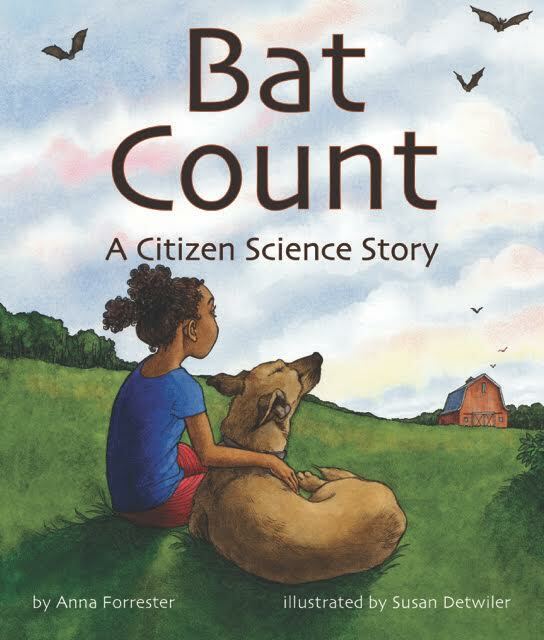 BAT COUNT introduces bats, white nose syndrome, and the empowering practice of citizen science in a story of action, reassurance and hope. Visit Anna online at www.annaforrester.com, at her blog Hmmmmm, or on Twitter @annaforr. This giveaway is for a copy of Bat Count. Many thanks to Arbordale Publishing for donating a copy for one reader. For a chance to win this copy of Bat Count, please leave a comment about this post by Wednesday, May 31st at 11:59 p.m. EDT. I’ll use a random number generator to pick the winner, whose name I will announce at the bottom of this post, by Friday, June 1st. If you are the winner of the book, I will email you with the subject line of TWO WRITING TEACHERS – BAT COUNT. Please respond to my e-mail with your mailing address within five days of receipt. Unfortunately, a new winner will be chosen if a response isn’t received within five days of the giveaway announcement. Comments are now closed. Vanessa Vaile’s commenter number was selected using the random comment generator so she’ll receive the copy of Bat Count. ← Writing “Things to Do” Poems: It’s All About the Action Words! Another great post to get me thinking. Bat Count looks like a good book. White nose syndrome is just making it’s way into our area. Ugh! Great piece to get me thinking. I love the Bat Count, too! Great way to share something they might not know about with my students. I like this idea of having conversations with yourself about the work. Bat Count looks wonderful, too—congratulations! I did The Artist’s Way years ago. Perhaps it is time for me to revisit that inspirational book. Thanks for reminding me. I find bats to be one of my favorite topics to use in the classroom. They often have such a negative connotation but are so crucial to our ecosystem. I love using bats in science but I also use bats to talk about social issues, not just conservation but not judging by looks and how important everyone is. Routine and perseverance in writing – two key areas to follow even if you don’t have your ‘mojo.’ Thanks for sharing. Wonderful post ! enjoyed reading it !! I’ve been using 750Words for daily “conversation with myself” writing. Over the years, my use has been intermittent but always for extended periods. Since I started when the app came out in beta, my account is still free. My writing experience and patterns (yes, the app saves those and has text analytics features I hardly ever use) show that I am most likely to make a daily writing goal when I start first thing in the morning. Initially I started using 750Words during my 11th or 12th NaNoWriMo and continued after. At present, I wouldn’t call my use primarily about myself as a writer or writing per se — more like thinking “out loud” in writing and reminding myself about projects, research, what I hope to get to (even when knowing I probably won’t). It’s also like a digital version of the handwritten journals I kept years ago. In short: I’m more likely to write every day when I start the day on 750 Words having a conversation with myself. PS About page, http://750words.com/about. Turns out The Writing Way inspired the app. Thanks for the 750Words introduction Vanessa — I will check out that app! These are terrific points as summer begins and I’m really trying to renew my own commitment to writing. One of my professors was adamant about morning pages and I was doing them and have gotten out of the habit. I think I’ll get back to them! The Bat Count book looks great-my husband and I do the Maine Frog Count and I teach bats in the fall. FYI-the link to your blog does not work. I’d love to check it out.